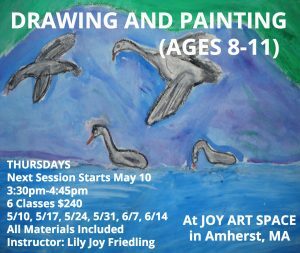 A new session of Drawing and Painting (ages 8-11) will begin Thursday, May 10! This is a great opportunity for kids to get involved in an enriching after-school activity where they can engage in self expression in a supportive environment. The studio is right on North Pleasant Street in downtown Amherst. Spaces are limited and often fill quickly—register soon (https://tinyurl.com/y83847y4) to ensure a spot in the class! In this class, students will find their unique artistic voice while developing drawing and painting skills. They will explore the process of taking ideas and turning them into works of art that are meaningful to them. They will explore skills and techniques for drawing and painting with a variety of materials. This class is capped at 6 students for small group atmosphere and individual attention.